Store-bought bookmarks are far from a necessity—it's easier (and cheaper) to just use an old receipt than to purchase a designated page-keeper. But sometimes you come across a bookmark that's just too cool to ignore. 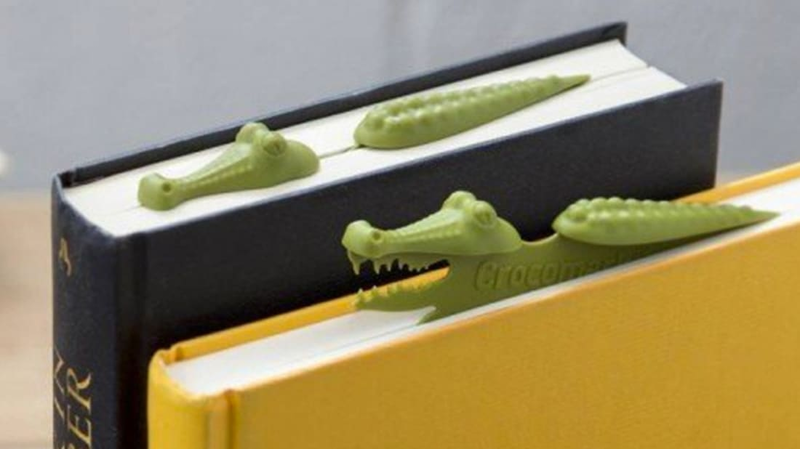 For some people, that bookmark looks like a crocodile lurking in the pages of their favorite read. The Crocomark by Peleg Design resembles the top half of a crocodile, swimming just above the surface of your page-turner, while the rest of the reptile slips inside the book. Lifting the creature up reveals its sharp teeth and claws because, we assume, he's devouring the story as hungrily as you are. You can get your own Crocomark here. If you're looking for something a little different (specifically mammalian), there's an equally threatening hippo bookmark for sale. To get out of the animal world entirely, check out this zipper bookmark that makes it look as though you're zipping pages up.